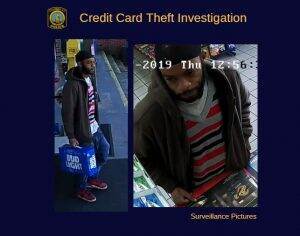 Investigators with the Columbia Police (CPD) Department’s Property Crimes Unit are working to identify a male suspect accused of stealing a credit card and using it to make several fraudulent purchases at various businesses. The victim reported that her credit card was stolen from a Harden Street restaurant on January 17, 2019. After the crime, she noticed purchases totaling close to $900 were fraudulently made. CPD investigators ask that you take a look at the attached photographs of the suspect.